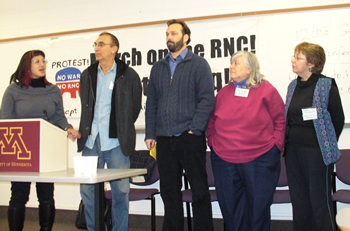 Voices from the RNC protest organizing conference | Fight Back! Anh Pham from the Coalition to March on the RNC and Stop the War introduces Carlos Montes of Latinos Against the War, John Beacham of ANSWER, Leslie Cagan of United for Peace and Justice, and Sara Flounders of Troops Out Now Coalition. 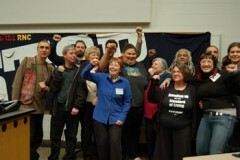 Minneapolis, MN - Activists from around the country gathered here Feb. 9-10 for an organizing conference to plan the anti-war protests at the Republican National Convention. The conference brought together more than 60 organizations and included the major centers of the anti-war movement, including United for Peace and Justice, International ANSWER and the Troops Out Now Coalition. Also present was Carlos Montes of Latinos Against the War. The event was organized by the Coalition to March on the RNC and Stop the War. Click on the names below for the mp3 of that person's speech, or right-click on a name and select 'save as' to save the mp3 on your computer. Leslie Cagan coordinator of United for Peace and Justice, an anti-war coalition with more than 1400 member groups. Angel Buechner a leader of the Welfare Rights Committee. Carlos Montes of Latinos Against the War.